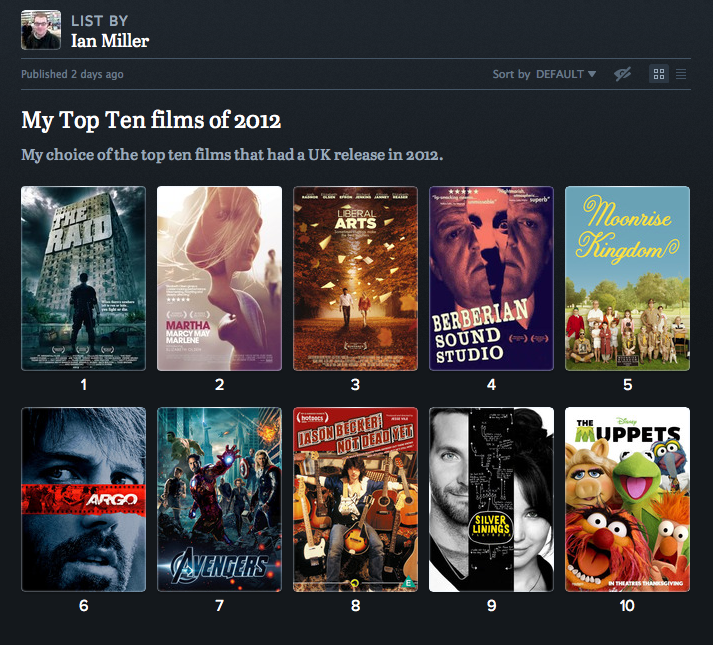 Without reasons and minimal descriptions (because you’ve heard everything you need to about these films a thousand times already), here’s a list of my top ten movies released in the UK during 2012. The choices are likely to change on the letterboxd.com page in time as I see more movies, but this is how it stands at the end of those twelve months. Reinventive. Gripping. Thumping. Kinetic. Balletic with violence. Most entertaining of 2012. Haunting. Smart. Cult. Behaviour. What is ‘normality’? Books. Music. Arts. Relationships. Curiosity. Crushes. Self-discovery. Everyone has something to teach. Everyone has something to learn. Watermelons. Horror through sound. Descent to Madness. Forces the darkness of your imagination, forces you to scare yourself. Paranoid. Compelling. Delightful. Precise… to the millimetre. Gripping. Dramatic. Interesting. Argo-f***-yourself. CRANSTON. HULK SMASH. PUNY GOD. Beat after beat of action-comedy… com-tion lets say. Perfection in its genre. Astonishing. ROCKING. Touching. Creativity is life-affirming. Almost drama. Almost Rom-Com. Entertaining and uplifting. Great performances. Joyful. Innocent. Happy. Positive. Funny Funny FUNNY. Fart Shoes. Notable applause for my two favourite surprises of the year; DREDD and PITCH PERFECT.